Due to complains by our target audience over the "2015 SUMMER BROADCAST TRAINING"‎ short notice.‎ The Management of Facts Digital Media, the Organizer of the "2015 SUMMER BROADCAST TRAINING is pleased to announced to you that the training has been moved ‎to 3/August, 2015. All to make your dreams of becoming the celebrity Broadcaster come true. ‎ Meanwhile, form still selling ‎@ our various outlets, visit our head office @suit 162, Naowa shopping Complex, Asokoro or Green plate Restaurant, wuse Market, you can as well get it @Suit VSF 3, New Banex Plaza, wuse2 Abuja. 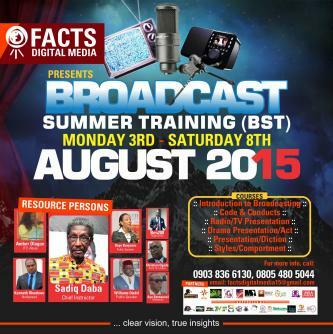 ‎ For more information call 08054805044, 09038366130 or email us @ factsdigitalmedia15‎@gmail.com This training is proudly supported by ITV, DTN, Love Fm. Facts Digital Media, ..............Clear Vision, True Insights.........‎ .